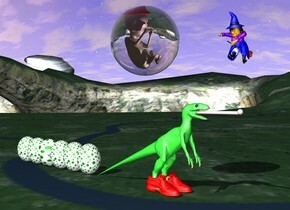 a 5 foot tall transparent sphere is 2 feet above the 6 foot tall lime green dinosaur. a 3 foot tall baby is 4 feet in the sphere. a 12 inch wide red hat is 1 inch in the baby. the hat is -28 inches in front of the baby. a light is 2 inches in front of the baby. a 2 foot tall egg is behind the dinosaur. the egg is leaning 90 degrees to the right. the egg is [greenpolka]. a 2.001 foot tall egg is behind the egg. the egg is leaning 90 degrees to the right. the egg is [greenpolka]. a 2.002 foot tall egg is behind the 2.001 foot tall egg. the egg is leaning 90 degrees to the right. the egg is [greenpolka]. a 2.003 foot tall egg is behind the 2.002 foot tall egg. the egg is leaning 90 degrees to the right. the egg is [greenpolka]. a 2.004 foot tall egg is behind the 2.003 foot tall egg. the egg is leaning 90 degrees to the right. the egg is [greenpolka]. a 2.005 foot tall egg is behind the 2.004 foot tall egg. the egg is leaning 90 degrees to the right. the egg is [greenpolka]. a 34 inch long red shoe is -54 inches in front of the dinosaur. it is -10 inches to the left of the dinosaur. another 34 inch long red shoe is -54 inches in front of the dinosaur. it is -12 inches to the right of the dinosaur. a blue witch is 10 feet to the right of the baby. the witch is facing the baby. the witch is leaning 40 degrees to the front. the witch's hat is blue. the witch's sock is blue. the witch's sock is blue. the witch's skirt is blue. the witch's skin is orange. a 3 foot tall 2.5 inch wide 2.5 inch deep pink cylinder is -12 inches in front of the dinosaur. the cylinder is 5.3 feet above the ground. the cylinder is leaning 90 degrees to the front . a 4 inch tall pink sphere is -1 inches in front of the cylinder. the pink sphere is -2.5 inches above the cylinder.